For data on beach closures from 2000 to the present see the RI Department of Health beaches page. For a map of beach closures, see the RI Department of Health beach closure map. 13 different saltwater beaches were impacted. Twenty-eight beach closure days marks the lowest annual total in over 15 years. Previously, there was a strong connection between rainfall and beach closure days as years with more rainfall also had more stormwater events that introduced contamination into the environment. In recent years, that relationship appears to be changing, possibly in connection to the implementation of the Narragansett Bay Commission’s Combined Sewer Overflow Abatement Project. The project allowed for installation of new infrastructure designed to reduce the contaminant loads that reach Narragansett Bay and tributary waters during rainfall events (see “Investing in Clean Beaches” below). East Providence’s Sabin Point Park is a beautiful spot to view Narragansett Bay, walk along the water, or play in the cooler bay air; however, there is one thing you can’t do at Sabin Point—swim. Sabin Point. Photo Courtesy of Watershed Counts. The beach at Sabin Point has been closed to swimming for decades due to high levels of pathogens that come from stormwater runoff and discharges from wastewater treatment facilities. But the city of East Providence, the RI Department of Environmental Management (RIDEM), and the RI Department of Health (RIDOH) hope to change that. In 2010, RIDOH increased its monitoring of Sabin Point and other urban beaches, as the first step in evaluating the possibility of opening these beaches to swimming. In 2016, the City of East Providence approved funding for a $100,000 project to identify and solve remaining pollution issues. 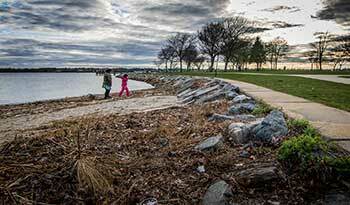 The state of Rhode Island and its wastewater treatment facilities have recently made significant investments (which were partially passed on to ratepayers) in capital improvements in order to reduce combined sewer overflows (CSOs), which can negatively impact beaches and cause beach closures. CSOs occur when heavy rainfall creates too much runoff for the combined stormwater and wastewater system to effectively treat or store. The result is untreated, contaminated water flowing to the bay, which in turn triggers beach closures and shellfishing restrictions. The Narragansett Bay Commission has implemented its CSO Abatement Program, with a total of $600 million spent so far on infrastructure improvements through the program’s first two phases, and another $815 million approved in August 2016 for the final phase. The program completed construction of a 3-mile long, 26-foot diameter storage tunnel 300 feet below Providence to store CSO during heavy rain events, and has connected numerous treatment facilities to the tunnel. Phase III will address overflows in Central Falls and Pawtucket that flow into the Seekonk River. Beach monitoring provides one way to evaluate how our investments are paying off. If beach monitoring results indicate that bacteria contamination is not being reduced, there may be a failure in the new infrastructure that needs to be fixed. If there is an issue with the design itself, future phases of the project can be revisited to ensure that more effective strategies are in place to reduce combined sewer overflows. Seeing current results that indicate reduction in bacterial contamination and beach closure days instills confidence that infrastructure projects are effective. Water from all sources flow to the publicly owned treatment works (POTW), which it northern Rhode Island is likely a Narragansett Bay Commission facility. When there is wet weather, water flows into the sewer quicker than the wastewater treatment facility can treat it, and the overflow drains to the bay. The CSO will increase the amount of water that can be held, waiting for treatment, before flowing into the bay. Image courtesy of EPA.